Looking for a fun place to take your kids for an Easter egg hunt? Where could be more fun than The Giggle Factory? 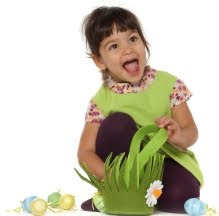 From 10 a.m. until 6 p.m. on Saturday, March 26, children will can hunt for little gifts left behind by the Easter Bunny. This event is free and open to children of all ages. The Giggle Factory has Easter baskets and is overflowing with great items to fill them. The Giggle Factory is located at 150-1824 McOrmond Drive in Saskatoon. Call 306-975-9630 for more information.